In the last post we were introduced to a piece of land in Harrison County, Virginia. In 1849 John and Isabella were prepared to deed this land to the brothers, Abia (a- bye-ya) and Robert, in exchange for title to land that the boys had inherited from their grandfather, Robert McClelland. This un-executed deed serves as a keystone document from which we will jump back into time. A will would be nice, but the 1849 document will have to suffice. 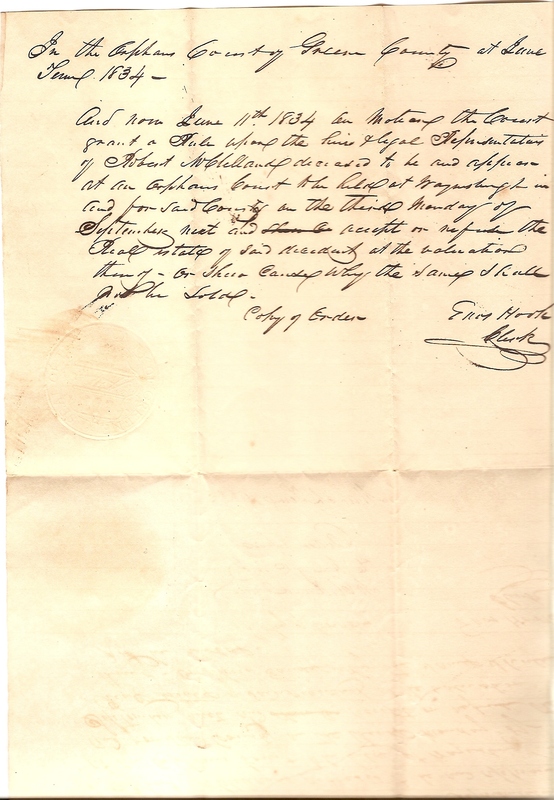 It states that “their share of a tract of land will,d to them the said Abia and Robert Minor by Robert McClelland deceased” is accepted as payment for the “Wilson Land” in Harrison County. When did they first become landowners? At the time of their grandfather’s death. When did Robert McClelland die? I do have a document to narrow the timeframe. And now June 11th 1834 an notice of the Court grant a Rule upon the heirs and legal Representatives of Robert McClelland deceased to be and appear at an orphans Court when held at Waynesburgh in and for said County on the third Monday of September next and accept or refute the real estate of said decedent at the valuation there of or shuo (show) county why the same shall ???? sold. It would appear then from this Orphans Court decree that Robert McClelland died after the court met in 1832 but before the March Term in 1833. The will must have stipulated that a tract of land be divided among his children, and among grandchildren if the child was deceased. This grandfather’s bequest secured a bit of future for a 17 year old Abia and 15 year old Robert. For whatever reason the young men chose to begin adulthood on the Wilson Land, using their inheritance as collateral. Our next transcription will uncover how John P. Minor acquired the Wilson Land of Harrison County.